Children do not learn in the same way as adults, especially when the learning process involves both intellectual and physical activity. At this age children do not have the same capacity as adults to analyze the environment. They explore and have an egocentric conception of the world. Children are still gathering the experience necessary to interact with their surroundings and with others. Also, empathy and the capacity to consider the thoughts and feelings of others is very low. In order to help children build their own experience, many exercises will be individual (e.g. each player will have a ball). The tactical component of the game will be reduced to small-sided games with basic explanations about space distribution. Training sessions will be treated more as physical education than specifically as soccer training. At this stage, the structure (but not the content) of the training sessions will be similar to that of older players. The main component of the training session will be technical. It is sensible at this age to develop technique and basic tactical understanding. Children’s capacity to solve problems increases significantly. Therefore players will begin working on basic and dynamic tactical scenarios. At this stage, players are pre-pubescent and have important physical limitations in terms of strength and endurance. Players at this age develop a good understanding of the game. However, these players are limited by their physical size and the significant changes, which arise with puberty. Safety should be the number one priority for the coach. The coach must be cautious to avoid overtraining should focus more on tactical and technical elements of the game and less on the physical aspects. Tactical training plays an important role at this age. 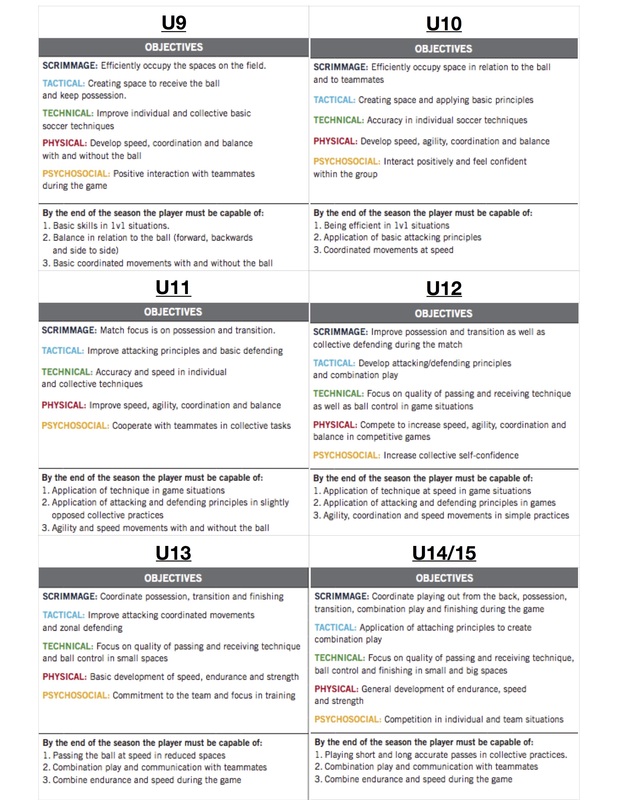 Players at this age have completed most of their physical and mental development. All components of training can be combined and organized with the purpose of developing the highest potential of the player. The strength of the muscles helps to develop technique at high speed and this speed helps the player to react faster to tactical situations. This stage is crucial for combining all the components of soccer in order to increase the players’ soccer knowledge.